Observation - Yellow Sloe type fruit - UK and Ireland. 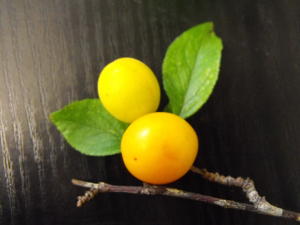 Description: We found this yellow fruit growing in a hedgerow and are unsure what it is. It looks like a yellow sloe or small plum. Does anyone know if it's edible? We found this yellow fruit growing in a hedgerow and are unsure what it is. It looks like a yellow sloe or small plum. Does anyone know if it's edible?